Kathy says, “I specialize in helping men and women 40+ address the “joys” of aging; including strength, balance and flexibility.” The thing is, she really does it! 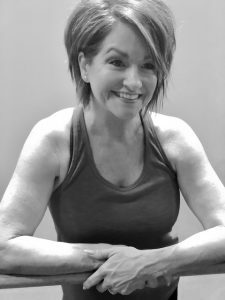 She is a certified personal trainer through the National Academy of Sports Medicine, and has been in the fitness industry as a personal trainer, corrective exercise specialist and group fitness instructor for over 25 years. Kathy’s primary goals are to help clients become structurally sound, improve functional movement and, of course, to help them meet their personal goals. Along with that, she likes to customize client’s fitness plans to accommodate any physical challenges from past injuries, as well as any current complications. In general, she’ll help develop the right type of workout program that best fits her client’s overall lifestyle needs. She’s simply amazing! Personal, Educational, Motivational and Fun!